If the user drags and hold a file over a running application in the Launcher, all the windows of that application should be shown with the spread. The user should then be able to drag and drop the file in a windows in the spread to load the file into that specific window. This codepath was mostly disabled in the current compiz and unity code because it was buggy, so the regression potential is very low, although it might happen that, if some race-condition happens, when closing the scale the launcher might be still painted as if it would be in scale mode (desaturated) even if it's not the case anymore. The Unity SRU debdiff for this can be found at https://launchpadlibrarian.net/180013321/unity-7.2.2-trusty-sru.debdiff. Bug #727903 needs to be fixed at the same time. On 2011-10-18, it was reopened for regression in Oneiric. Launcher Specification, use case 2.17, documents this. Can we get some re-confirmation from design on this feature? What is needed to reconfirm? Dragging to the launcher should spread all windows, and then dragging to a window should zoom in and focus that window. So one can drag to a particular window for a running app. And this is a critical feature, please prioritise it accordingly, we need to test it. Still waiting for the link to the feature-spec, so Jason has everything he needs. Is this related to #697358 ? I removed all the unity components btw. Thanks for not having critical dependencies on that. But I would like this functionality restored for the classic desktop as well. As well as being able to reshuffle the order of open windows. - once a spread has appeared, dragging the file to another valid application icon in the launcher should switch the spread to that application. This currently doesn't work. - if the user drags a file over a launcher icon for a app that only has one window open in the current workspace, that one window should be shown in spread view. Re-opening this bug as this feature seems to have regressed in Oneiric and no longer works. Can we make a list of the bugs that should be solved to re-enable this behavior? I think bug #863408 is related. shouldn't this be set as a milestone for precise? DnD is a *key* feature of any desktop OS. A quick fix for users is to enable the edge binding in the compiz scale plugin. So you can at least drag an drop in an other window (see http://askubuntu.com/a/43526/10475). But this has to be fixed. > duplicate bug report (963548). > expose'. Add dismiss behavior on the specs. It's very odd this bug hasn't resolved yet permantly. I have to agree with Cicoandcico, Drag & Drop is a key elelement in every OS. Right now it's not even possible to move a file with D&D from one Nautilus window to another one, when both are maximized (what's the default behaviour). The workaround Itoas tells us about works indeed, but is not acceptable for normal users. Hopefully this can be fixed ASAP for 12.04. Why has this bug not being addressed yet? Drag and Drop becomes a vital part of developers' lives. Also, now Ubuntu is more focusing on end user as a consumer for Ubuntu. For a normal user, drag and drop is all there is. A normal user will not even look for this on google. For him/her it will be something of a roadblock and simply drop the OS. This needs to be addressed asap for Ubuntu to be the way Canonical want it to be. It seems that DnD works with files and the launcher in "always show" mode. Probably this is a problem with the auto-hide function of the launcher? DnD with marked text does not work. Another problem I found, is that disabling auto-hide again does not work, the launcher stays in auto-hide mode, so I had to test DnD with the guest account. When I tried it, I had launcher behavior set to "always show". No DnD there. I even filed a bug which then turned out to be a duplicate of this one. but every time I decide to give Unity a try it screws me over -_-; it has gone even further this time - a few days ago I turned on my computer and Unity was gone from the session menu and I couldn't get it fixed. Wow. > Unity was gone from the session menu and I couldn't get it fixed. Wow. > duplicate bug report (774240). > > Unity was gone from the session menu and I couldn't get it fixed. Wow. > > duplicate bug report (774240). > > expose'. Add dismiss behavior on the specs. > duplicate bug report (870769). I said 11.04 because of that, that this was working on Natty. > > out of the box. > > > this one. > > > Unity was gone from the session menu and I couldn't get it fixed. Wow. > > > duplicate bug report (774240). > > > expose'. Add dismiss behavior on the specs. > > duplicate bug report (870769). This is incredibly unintuitive and time consuming, especially for people working on reduced screen space, with all windows maximised, on a tablet or a netbook for example. - Place the file wherever wanted on the document. I hope this will be addressed soon and integrated in 12.04, as it is a LTS and should be as usable as possible. 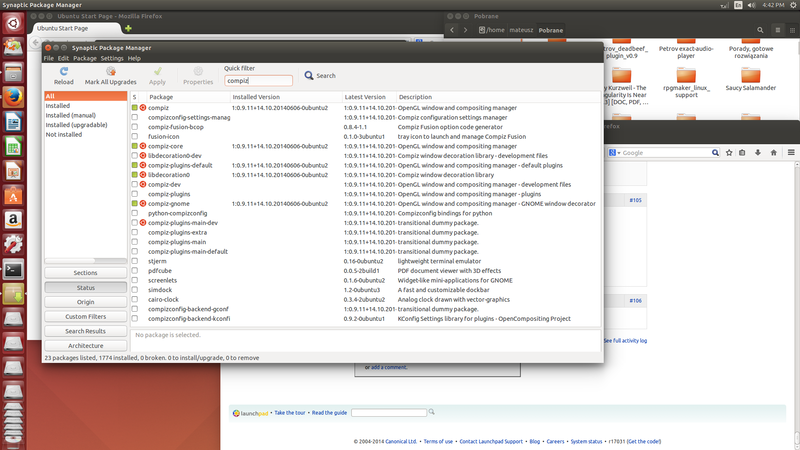 Thanks Ubuntu, you really know how to make Linux look stupid and useless. I don't need to put my 2c or sarcasm here, but bug is a year and a month older than my son. Anyone going to fix this or should we start a Fund for School fees? Did you guys hear about the new behavior of the spread windows screen? > Can't be extracted from Ubuntu 11.04 Unity's sources? > > for School fees? > > duplicate bug report (963548). I don't see conflicts with the spread design (http://design.canonical.com/2012/03/task-switching-in-ubuntu-and-a-introduction-to-the-spread/). The drag & drop onto the launcher should trigger compiz scale, spread or whatever type of window switcher. And of course then dragging onto the appropriate window should bring that to front - whatever type of window switcher used when clicking (or dragging in this case) onto the launcher icon. And yes, I also wondered very much that this does not work on Unity. When I tested earlier versions of Unity I wasn't either reporting that as a bug as I was sure they know and fill finish that until 12.04 final. But by all this complaining about unity, let me say that I evaluated all the desktop environments around for several times lately and came back to unity. There are several very nice features and I fully understand Canonical for doing their own way. The best alternatives around do - more or less - copy Windows (again). Unity has a few core features that make the difference in being more productive than on Windows. Remember: Desktop, Task and window switching features are core features of a desktop environment. For people just using one app during the day it is pretty irrelevant which DE they use. For all those using more apps and more windows opened on more desktops the OS that will win the OS war will be that to handle this more efficiently. And I think Unity is on a good way. But of course, missing functionality like this to be fixed ASAP - not just for the next Ubuntu-Version! Is this bug confirmed to Unity for Ubuntu 12.04? > Is this bug confirmed to Unity for Ubuntu 12.04? 11.10, in every possible state. > > Is this bug confirmed to Unity for Ubuntu 12.04? Nothing new on this one? Our company should migrate from 10.04 to 12.04 this summer, but this bug is the biggest show stopper since our applications rely heavily on dnd. I really don't want to put gnome fallback session or migrate to another distro just because this one can't be fixed. @robi-hipnos and @pabloalmeidaff9; This is still on our todo list, but there are several bugs in this area that need to be fixed before it can be re-enabled. When it gets fixed really depends on finding someone to fix it, so if you are interested in working on this and submitting some patches it would be much appreciated ;-) If you need some advice on how to get started contributing to Ubuntu contact jcastro or njpatel on #ubuntu-desktop on Freenode IRC. Basically you're saying that Unity is being developed without developers who can fix the mess underneath? I didn't mean to criticise and if I was a developer I'd gladly help, but Ubuntu kind of forced us to use Unity which now seems to be only half finished. Nobody I know wants to switch to newer versions because desktop alternatives are as crappy as Unity itself so they stick to old releases which will soon become a security issue when support is dropped. We are not really facing a bright future here, don't we? 1. Is this functionality even supposed to exist in any form on this version? 2. If it is, how can I tell if it actually does exist? 3. If it does exist, how would I be able to ensure that it is actually working? it seems strange to me that nobody did yet because. 2. It is a REGRESSION. This feature was present in Unity on Ubuntu 11.04.
simple hack to me, but I might be wrong. > 2. If it is, how can I tell if it actually does exist? > windows in the spread to load the file into that specific window. > Bug #727903 needs to be fixed at the same time. > On 2011-10-18, it was reopened for regression in Oneiric. Will this land in 13.10? It must not be that hard. This bug should have been fixed already. Unity launcher can perceive a file you are trying to drag and drop from a nautilus window. We can drag&drop a file to the trash icon, and it works. This bug makes Unity useless. If we want to drag&drop a file from Archieve Manager to desktop, we have to make all windows minimized or to open the Desktop directory in a nautilus window, why? As Pablo Almeida wrote, this must be an easy fix, obviously. @johnlea ; as said above, @pabloalmeidaff9 wants a confirmation to start trying to fix this bug. I stated I agreed with him, giving some additional information. I think, the information I gave about the trash icon would be helpful for someone who will try to fix it. What I posted was a comment and comments must be gratefully accepted, too. seems to handle all clicks and mouseovers for quickmenu and handles collision by itself. The scale function (ScaleWindowGroup) is called multiple times in `src/ApplicationLauncherIcon.cpp` and defined in `unity-shared/PluginAdapter.cpp:880`. I hope all that is left to do is create a timer (and maybe a collision-case) for `ProcessDndMove`, call the akready implemented `ScaleWindowGroup` and add an action for `DndLeave` if (spread=true). Unfortunatle I don't have the time nor experience to work on it myself right now, but hope I could point somebody to the right places to look at. This is bug is over three years old. Is someone working on this? Drag and drop is a basic functionality of every modern desktop. I can't believe no one has worked on this for three years, when there are even comments from Mark Shuttleworth about the criticality of this issue. I think ubuntu missed every basic feature on their desktop. > comments from Mark Shuttleworth about the criticality of this issue. I'm experiencing this bug still in 13.10. Apparently this bug is not fixed yet. As Ubuntu 14.04 LTS will still be shipping with Unity 7, I hope it will be fixed by then. Unfortunately I don't have the necessary skills to do it myself. Thanks a lot in advance to the person who can get it fixed, I think it would really improve the Unity user experience. It is very sad to see a 3 years old critical issue abandoned. a ton of work in X and we should just nail this in Unity8. So this probably won't go into 14.04. It is a pitty - I think that losing the ability to drag and drop from one place to the other (and to/from file roller in particular) is a massive productivity loss (at least in my company)! Why doesn't anyone knows about this annoying bug? > least in my company)! People do know. Mark himself already commented on this thread. > Why doesn't anyone knows about this annoying bug? > > least in my company)! > > windows in the spread to load the file into that specific window. > > Bug #727903 needs to be fixed at the same time. > > On 2011-10-18, it was reopened for regression in Oneiric. Yep, also people know about global heating, but doesn't make any change. > People do know. Mark himself already commented on this thread. > > Why doesn't anyone knows about this annoying bug? > > > Interestng Mark. > > > least in my company)! > > > windows in the spread to load the file into that specific window. > > > Bug #727903 needs to be fixed at the same time. > > > On 2011-10-18, it was reopened for regression in Oneiric. to help me at the mailing lists. Then I gave up. > Yep, also people know about global heating, but doesn't make any change. > > People do know. Mark himself already commented on this thread. > > > Why doesn't anyone knows about this annoying bug? > > > > Interestng Mark. > > > > least in my company)! > > > > duplicate bug report (774240). > > > > windows in the spread to load the file into that specific window. > > > > Bug #727903 needs to be fixed at the same time. > > > > On 2011-10-18, it was reopened for regression in Oneiric. > > > duplicate bug report (870769). Also, it is in C. But not your plain C. THAT kind of C.
> to help me at the mailing lists. Then I gave up. >> Yep, also people know about global heating, but doesn't make any change. >> > People do know. Mark himself already commented on this thread. >> > > Why doesn't anyone knows about this annoying bug? >> > > > Interestng Mark. >> > > > least in my company)! >> > > > duplicate bug report (774240). >> > > > windows in the spread to load the file into that specific window. >> > > > Bug #727903 needs to be fixed at the same time. >> > > > On 2011-10-18, it was reopened for regression in Oneiric. In Progress? Wow! I would love to see this bug gets fixed in Trusty. Is this really fixed with the release of new packages in Utopic or does the Bug #727903 needs to be fixed also or is some other pieces missing. I'm asking because when trying out latest Utopic image (from 9th June) in live mode the DnD didn't work, there was no spread of windows only the icon gets highlighted. Also I had very bad graphics glitches after dropping files on icons where two or more programs were open (for example two Gedit windows). Yes all the compiz packages are at that revision. I attached screenshot of Synaptic. Also Unity is at version 7.2.0+14.10.20140606.1-0ubuntu1. fixed branch right now. Thanks for the testing. I checked the newest Utopic daily live image and everything works now as it should. Now we just need the Bug #727903 to be fixed and DnD will be perfect in Unity 7. The Unity 7.2.2 SRU debdiff. The Compiz 0.9.11.2 SRU debdiff. Hi, I'm trying the last unity version from trusty-proposed, and I find a little defect. Try opening 2 or more windows of the same app (for example nautilus/file manager) in two different workspaces. Now from one of those workspaces DnD something to the related icon on the Launcher: the spread will show only the windows in that workspace. I think this is not a correct behavior. Well, I thought about that when implementing it, and I was a little undecided, but I think this is actually the correct behavior considering the way that workspaces are handled in unity, where they're always a "different world" (so this is for alt-tab, and launcher). So, in the same way you won't be able to switch - using the mouse - to a secondary instance of an application that is open in a different workspace, using the DnD should not behave differently. So, in terms of consistency I think we're right. Although I understand there's a loose of functionality (and no, pressing ctrl+alt+arrow to switch workspace when dragging something is not convenient). so I think we maybe could allow this when pressing Ctrl when clicking/DnD'ing over an icon, or something like that. Feel free to open a new bug, including ayatana-design. > "different world" (so this is for alt-tab, and launcher). > using the DnD should not behave differently. > an icon, or something like that. > Feel free to open a new bug, including ayatana-design. That's a feature I was missing for a very long time. It now works the way I expected. > That's a feature I was missing for a very long time. > It now works the way I expected. > Thanks a lot for fixing this! > in the spread to load the file into that specific window. > application supports that content). > (desaturated) even if it's not the case anymore. Finally , after 3 years of waiting, thanks to everyone involved.